W-wa Jeziorki: Seen it somewhere before? 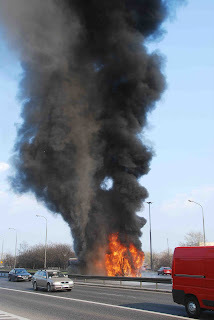 Yes, Jeziorki.blogspot.com is the premier English language website for pictures of blazing Warsaw buses! 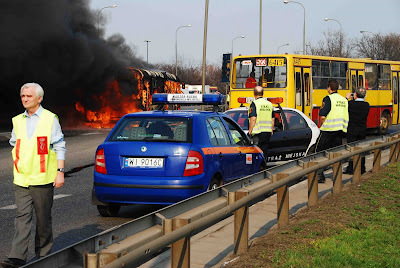 A fire on an eastbound 188 bus at half past three this afternoon on Warsaw's key east-west artery paralysed traffic for hours. In the office, we could smell smoke. At first, we suspected a cigarette in the bin outside. We went out to investigate. A cloud of black smoke grew ever higher and denser behind the school on ul. Fabryczna - I ran to see where it was coming from - I could see a fire burning on the Trasa Łazienkowska beyond. I dashed back into the office to grab the camera, and ran along ul. Kośmińska to the end, turned left - and saw this sight. The sound of the tyres popping was heard inside our office 250 metres away! Unlike the fire in June, which happened around 6 am, this one was witnessed by hundreds. 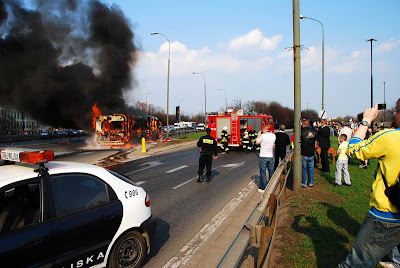 I was amazed at how many cameras (proper SLRs and videocams as well as phonecams) were at the scene - pictures were on the TVN Warszawa website by the time I got back to the office. The power of citizen journalism in the online world is astounding. Above: waiting from the fire crews to make their way through the stationary traffic on Trasa Łazienkowska. Below: The crowd watched as if this were a family fun-day firefighting display. 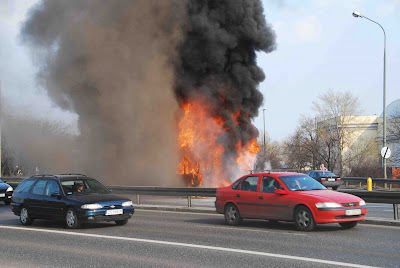 Within minutes, the blaze is out, and the show is all over, with just a huge traffic jam remaining (for several hours longer). 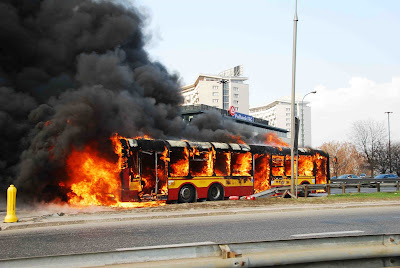 Fortunately, no one was hurt in the fire, although media reports about the bus driving along while on fire and the driver not wanting to let people out sound a bit alarming. What is it with Polish buses? 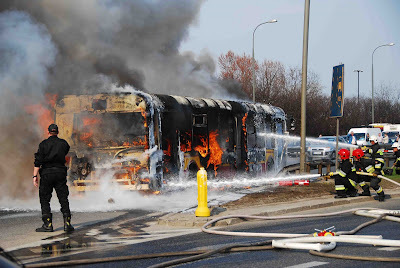 Another one caught fire in Warsaw last week! The guy in the green scuttling off because a tyre exploded - what a wussie!